The basis of sound dental care is routine cleaning and maintenance. 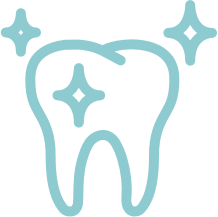 We customize dental cleanings on the basis of your periodontal (gums and bone) health. We utilize medicated gels, along with prescription mouth rinses in problem areas, if necessary. Ultrasonic scalers are sometimes used to make the procedure more comfortable and effective. Not sure which cosmetic dentistry treatment is right for you? Get in touch with the trusted dental hygienists at Magnolia Dental today!